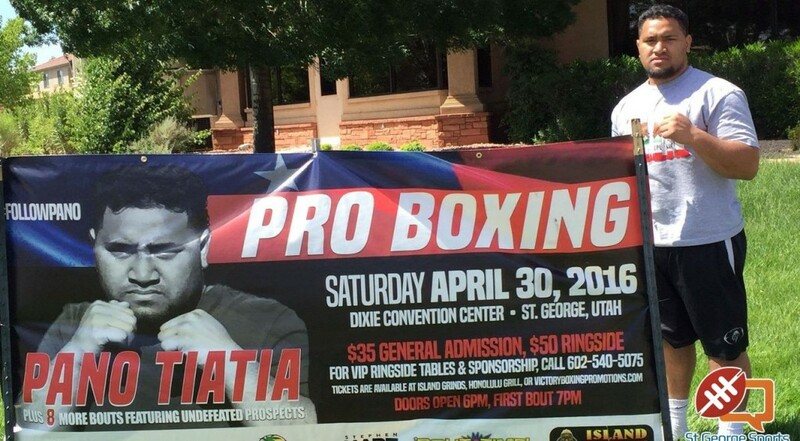 ST. GEORGE – It is fight night in St. George. Those who attended Friday’s weigh-ins for tonight’s fights saw superior athletes ready to go at it tonight. Jones is a 24-year-old southpaw from the boxing capital of the world, Philadelphia. He was 84-11 as an amateur and has four national amateur titles to his credit. He is one of three Victory Promotion boxers to debut tonight. His opponent is Thompson from Chandler, Ariz. Thompson is a 35-year old with six bouts to his credit. Thompson was two pounds over on the weigh-in and will have to make weight (135) by 9 a.m. this morning. Cameron is a 27-year old from England. He is based out of Las Vegas. Both of his professional bouts failed to go the distance as he has knocked out his two opponents. He will be facing 27-year old Schulz out of Ogden. Schulz is a last-minute replacement and will have his professional boxing debut tonight. Schulz is more well-known in MMA circles and is affiliated with One-Hit MMA and is 5-3 in his professional bouts. Capper is a 27-year-old from Perth, Australia. He has competed in other disciplines such as MMA, Muay Thai and kickboxing. He just defeated Jorge Juarez two weeks ago in a bout held in Mexico. He is an entertaining fighter known for his craziness both in and out of the ring. His opponent is Rittenbaugh, a 35-year-old southpaw from Torrance, Calif. This will be a classic battle between a knock-out artist and someone who boxes on points. Rittenbaugh has never been KOed. Sanchez, aka “The Shark”, was 178-9 as an amateur and ranked as high as No. 3 in the world. He has won all of his professional bouts by knockout. The 21-year-old turned pro in January and has not disappointed. His opponent is 28-year old southpaw McCain from Tucson, Ariz. After winning his first two bouts, McCain dropped five in a row over a year period, including his first to Wes Capper. But McCain is back on track, forcing a draw and winning in his last two fights. Ennis, a 20-year-old from Philadelphia, is from a boxing family. His two brothers, Derek and Farah Ennis, both have solid professional careers. Ennis was the 2016 U.S. Olympic alternate before deciding to turn pro. While listed as a southpaw, Ennis can switch easily to fight right-handed. He was considered the No. 1 prop prospect in amateur boxing. His opponent is 28-year-old Muldrew from Chandler, Ariz. After losing his last two bouts by knockout, Muldrew took some time away from the ring. This will be his first fight back in almost 18 months. Perhaps one of the most anticipated fights of the evening. Both fighters are Hungarian. Both are undefeated and have won all their fights by knockout. Daranyi, a 21-year-old residing in Toronto was 87-2 as an amateur and a two-time Hungarian national champion. Little is known about Szilasi. He is another late replacement. He had a 13-3 record as an amateur. He won his last fight by knockout in the first round. He resides in Spokane, Wash., and is managed by Jose Diaz from Three Forks Boxing out of Montana. 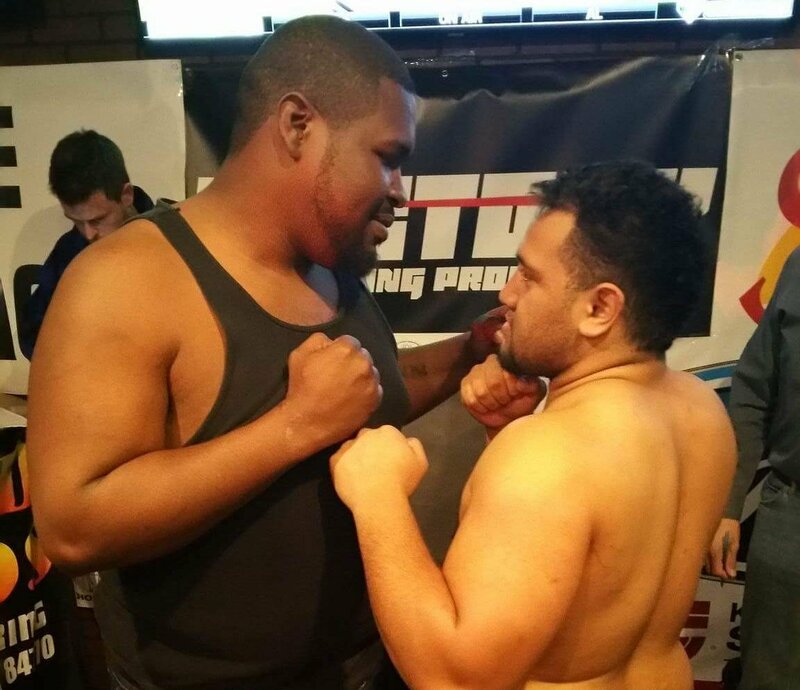 John Orr (l) and Pano Tiatia square off at the weigh-in Friday night. The two will meet in the ring Saturday night at the Dixie Center. The draw match of the evening features local fighter Pano Tiatia in his professional debut. Tiatia compiled a 73-6 amateur record, including four National Amateur gold medals, a World National Amateur boxing championship and several victories against top amateur prospects from Russia and the Ukraine in the World Amateur Championships. Tiatia was ranked No. 1 as an amateur heavyweight in the United States in 2013. His opponent is “Big John” Orr from Kansas City. Orr also competes in MMA and sports a 6-7 record in that discipline. Orr’s 1-6 boxing record has come against superior talent boxers with a combined record of 32-1. Orr weighed in at 320 pounds, giving him a 90-pound advantage over Tiatia and also stands at 6-foot-3, seven inches taller than his opponent. Tiatia has faced and defeated larger opponents as an amateur, including highly-touted Darmani Rock, who recently signed with Jay Z promotions. The first bout is scheduled for 7 p.m. this evening at the Dixie Center.